That phrase has challenged me deeply as I have spent the past few months meditating on what it means in my life. I have heard it repeatedly over the past decade, yet never stopped to understand the gravity and depth of its meaning. It was in my brain but not in my heart. It held no meaning for me whatsoever; it was just one of those things Christians say. And so I said it. But I didn't live like it was true. I have always longed for deeper meaning in the little things of life. My time as a stay-at-home mom is often spent caring for my daughter, doing laundry, changing diapers, cleaning the house, gardening, canning, cooking, baking, organizing, and cleaning some more. I enjoy it, but it always lacked eternal meaning for me. or is it simply a means to an end. My spiritual life was always separate from the rest of my life. I read my Bible prayed, and had a relationship with Christ but then I left God in my devotion time and lived the rest of my life on my own. Because of this chasm between my spiritual life and the rest of my life, serving wasn't something I was always glad to do. I often did it as an obligation or because that's what Christians are "supposed to do". That was the first sign of something being wrong with my perspective in life. If we aren't finding joy in meeting the needs of others, then we need to take a look at our own lives and see if we are living for our own happiness rather than finding our joy and satisfaction in the Lord. "Love is the overflow of joy in God that gladly meets the needs of others." As I find my joy in Christ and my satisfaction in Him and the work He has called me to here on earth, serving my husband, my daughter, my friends and those around me is not a burden but just a natural overflow and sharing of the joy I have in Christ. God has taught me so much over the past few months, and given me a depth of joy as I find satisfaction in the life He has given me. My time with Him has overflowed into the rest of my life. All of a sudden everything has meaning. Formerly purposeless things in my life, such as washing dishes and changing diapers, suddenly have eternal value. You see, I serve the living God. He created me for His glory and His pleasure! When I delight in the work that He has given me to do and am satisfied with the life he has called me to, there is eternal value to it because I am fulfilling my purpose here on earth, namely glorifying God. I am so thankful for the new found meaning in the everyday monotonous tasks of life that God has given me. Yes, there is joy to be found, even in changing diapers. Who knew? It is my prayer that every daughter of God discovers this joy, satisfaction and purpose in life. So true - thanks for sharing! It's an awesome God-given job, isn't it? And hard to keep it in perspective sometimes, as you said. Great post! Great reminder for mamas everywhere! I'm glad you found this perspective and that you have joy in the monotonous tasks of motherhood. I find it so sad when wives and mothers don't see the value in the work they are doing within the walls of their homes. I'm so thankful a lady I attend church with told me shortly after my boy was born that God sees the work we do in our homes. He sees it and it ALL matters! 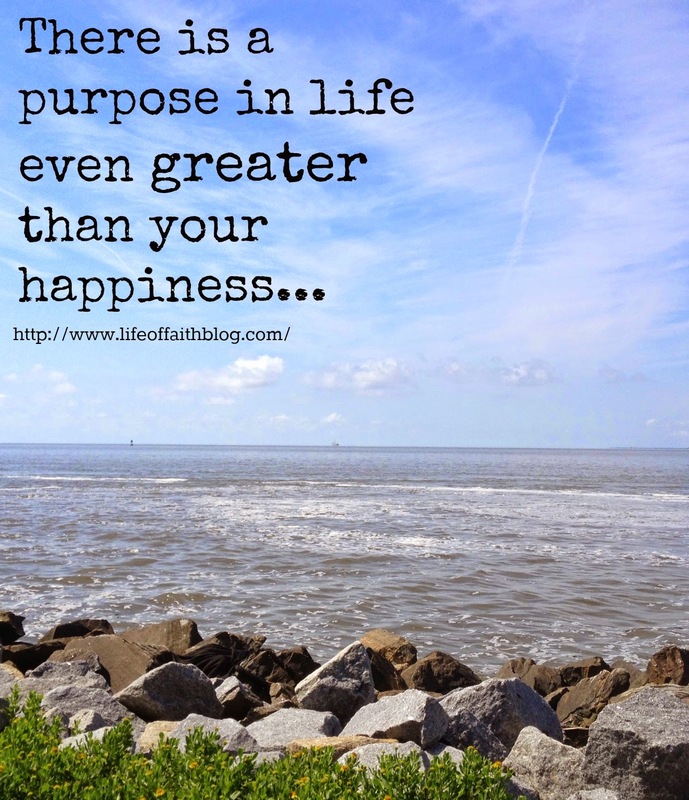 I also love the quote you used "there is a purpose in life even greater than your happiness." So many people today think their happiness is all that matters, but that couldn't be farther than the truth. Sometimes your "happiness" can affect others negatively.